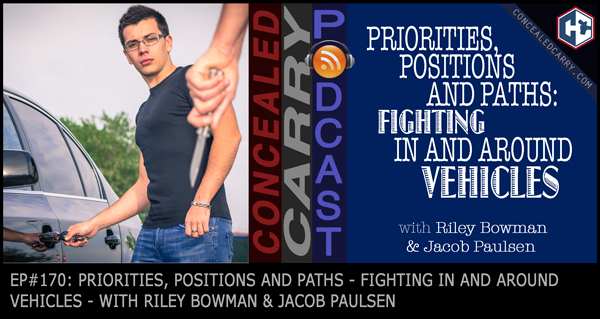 Riley and Jacob recorded this special episode while they were on their way back from Utah where they spent a few days filming and putting together a special vehicle fighting and tactics course. In this episode you're going to want to listen closely to the 3 P's – Priorities, Positions and Paths. Understanding these concepts and how they play into scenarios inspired by real-life events may one day save your life. Press ‘PLAY' to listen now! Our sponsors made it possible to put together this comprehensive vehicle tactics course by providing a vehicle, windshields, firearms, and ammunition. THANK YOU! Don't forget, you can always reach out to us at [email protected]! There was a man here who engaged some people who had robbed a store. They started firing at him as he tried to stop them, so he fired shots into their car. One of the bullets hit some part of the seat belt and ricocheted, hitting a woman in the backseat, killing her.